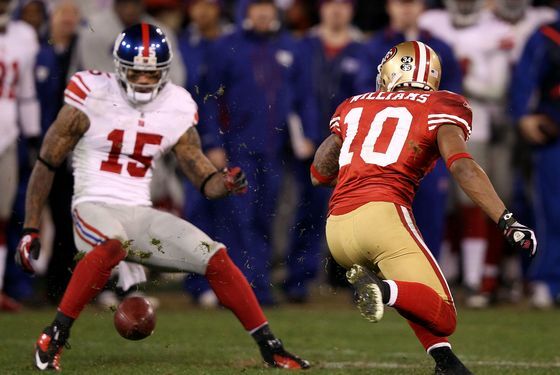 Did Giants Strategically Concuss Kyle Williams? The Giants' win over the 49ers in a magnificent throwback conference championship game at Candlestick Park yesterday turned on two fumbles by 49ers punt returner Kyle Williams, an obscure second-year player. That made Kyle Williams personally responsible for ten points in a game that ended 20-17. And the Giants, interviewed in the happy haze of the winning locker room, casually noted a provocative element of their game plan: They'd targeted Williams for extra violence because they knew he had suffered several concussions in the past, and they think it worked. After the game, reporters crowded around the locker of Jacquian Williams, who'd forced the second fumble, hoping for an angle: Had the Giants noticed something about Kyle Williams's technique, some weakness in the 49ers punt-return scheme? "Nah," Williams said. "The thing is, we knew he had four concussions, so that was our biggest thing, was to take him outta the game." It certainly sounds like the Giants' special teams players were told about Williams's history of concussions, and that they went after him because of it. (That this has so far drawn no attention from beat reporters suggests that such planning is commonplace). It's impossible to know whether Thomas is right — if Williams in fact was concussed or woozy during the game — but he didn't look himself yesterday: There was the third-quarter punt that skimmed off his knee after he seemed to dawdle, unsure whether to pick it up or let it roll, and at least two punts that he fair-caught though he had plenty of room to run. Sports Illustrated's Ann Killion also noticed "a fumble on a reverse that he fell on, a strange sideways diving catch on another punt that could have been disaster." Williams played virtually the whole game at wide receiver and didn't register a single catch. Part of the seduction of the NFL post-season is the crucial contributions that often come from anonymous players at the back-end of a roster, the backups and special-teamers and would-be David Tyrees whose contributions can turn a merely good season into a potentially historic one, or (in Kyle Williams's case) vice versa. Peter King took this as his theme in his influential Sports Illustrated column this morning, making the case that the Patriots and Giants will play for the Super Bowl because their end-of-the-roster players outplayed their counterparts on the Ravens and the 49ers. But it's worth being clear about how brutal the contributions of those players often are, particularly in the pinballing, collision-physics world of special teams. In the context of the current, horrifying concussion epidemic, it's one thing to argue, as many of the NFL's defenders do, that violence is endemic to the game. But it is startling to realize that concussions aren't just an injury but a strategic vulnerability. In the league's detail-obsessed environment, where coaches seek to leverage the tiniest advantages, a history of concussions doesn't only make you a red flag on your team doctor's list. It also makes you, in opposing film rooms, a target.